All my favorite bloggers have posted good articles about the changes in the Ancestry.com DNA pages. I have put a list of them at the end of this post. The improvement in Ancestry’s DNA matching has greatly reduced the total number of matches, which ran into the thousands for many of us. The theory is that their new algorithm has gotten rid of those matches that were unlikely to share a common ancestor in the genealogical time frame. I am hopeful. 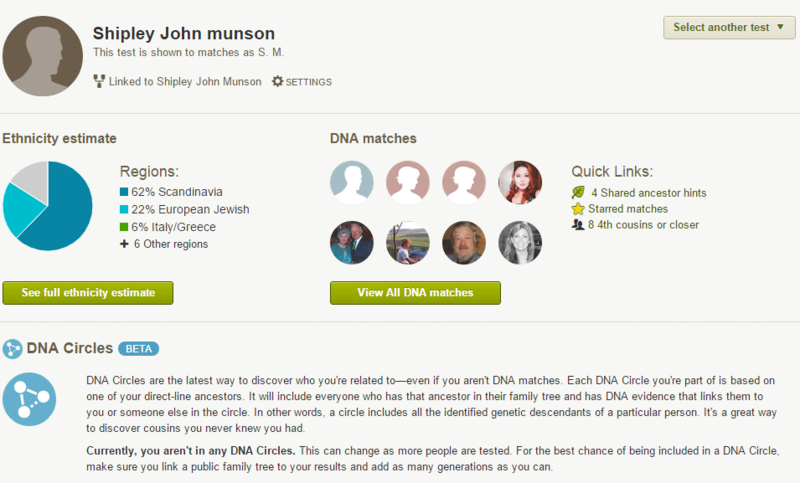 And the new DNA home page for a person is much nicer looking and more informative as you can see below. Looking at how my brother with one Jewish grandparent has fared, all his 4th cousin Jewish matches (dozens of those) are gone. This is probably correct. The few that I have been in contact with are not recently related. He has some new Scandinavian 4th cousin matches, one of whom I can see is probably a double 7th cousin. Their line is from our somewhat endogamous Etne ancestors, many of whom seem to descend from the Skiftun/Koll clan while many others descend from the Galtungs via Ve and Fatland. We think we have identified a few Koll bits of DNA from the 1500s. The shocking thing is that two of his green leaf DNA relatives have vanished. Plus one of his distant green leaf cousins has moved to the 4th cousin list. Yes she is related on the endogamous Etne line; she is a known 5th cousin twice removed, descended from the Ve family. Question for Kitty or someone else better versed in DNA enhanced genealogy. Over on GEDMatch I have a 5-6 degree match with an e-mail address in FINLAND! I did the “one-on-one” comparison and she appears to be a genuine match, not an IBC sort of pile-up match. I have NO known ancestry in Finland. Her first name is of Finnish origin. Now is this person a real match? Or some other kind of “false positive.” I’d like an educated opinion before I write her an e-mail. Lydia – It is always fun to contact possible relatives in my opinion. Besides all her ancestors may not be Finnish. “There are today at least 25 million descendants of the Swedes and Finns of the Delaware. At least half of these, perhaps more, have one or more Delaware Finns in their family tree. Although I’ve been mostly pleased with my Ancestry.Com DNA experience, I think ancestry still has some bugs to work out of their system. I have at least 3 instances of maternal matches that end up being rated at a higher level for myself than for my mother – I know these matches are from her side and not my father’s – how is it possible that I could inherit dna that she doesn’t have? I’m not trying to be picky here but these are some of my best matches (extremely high, very high) and knowing that there is an issue here makes me doubt how accurate their results, in general, are. I’ve made several connections on my paternal side of my family, but as of yet, I haven’t found a single person that I can prove is related on my mother’s side of the family (very small tree). Working through her matches is like looking for a needle in a haystack – I’d like to know that I’m not wasting my time barking up the wrong tree trying to find a connection with these supposed high confidence matches. Have you heard of other instances like this? As far as losing matches, it took some of the pressure off -lol – I never would have gotten to all of them! 1) you match this person on your Dad’s side as well, either a real match or more likely a false match like the cases I have seen. Thanks for your quick response. I do have her results at Gedmatch and fully upgraded at Family Tree. I think you are right about the computer picking up bits of DNA and that these bits are false matches, they coincidentally match up not because they are related but because they are such small bits they could match with many individuals. the individuals I am particularly interested in emigrated in the early 1880s (supposedly) but because of a lack of emigration, census, birth, marriage, death or obituary records I haven’t been able to dig any deeper – it seems they just dropped out of the sky in 1901 when they were married. On her other side, they were from Rugenwalde, Pommerania and I dead end again as their parents are not listed on any documents – the famous “don’t know” response seems to prevail. I am under the impression that many German records were destroyed as a result of two world wars and I may never find a marriage record for my great, great, grandparents. I will continue to hope that someday a relative with a name I recognize, can connect or triangulate with others will turn up on her DNA matches. Thanks again, I enjoy your blog. German records are pretty good but not always online or even filmed by the LDS church. I went to a great talk by Michael Lacopo of Hoosier Daddy about online German resources and as soon as I have time I will try a few and blog about it.